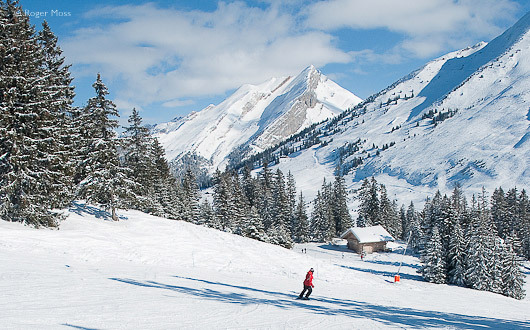 Close to both Annecy and Geneva, from which it has long attracted large numbers of recreational skiers. 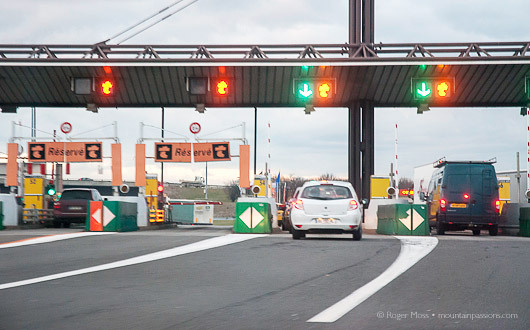 There are swift transfers from Geneva airport, and this is one of the closest areas for drivers from the UK. Despite a relatively modest altitude, snowfalls tend to be reliable enough to ensure long seasons. Just above the village is the famous Col des Aravis (gateway to the Val d'Arly) on the Route des Grandes-Alpes, while further up the valley is Le Grand Bornand, included in the Aravis lift-pass. 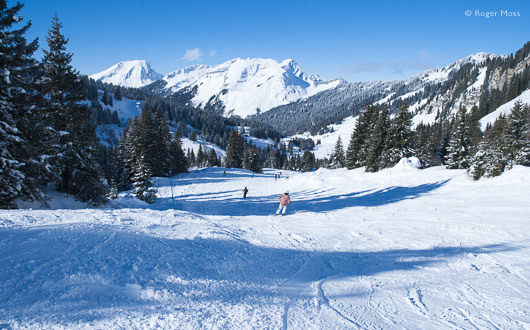 Ski amid the natural beauty in Manigod and Beauregard sectors. For more challenging terrain head for the Massif de Balme. Experienced skiers will opt for the Aravis lift-pass, which adds shuttle-linked le Grand Bornand to the mix, along with a subtle change of style and scenery. La Clusaz’s own skiing, though, is surprisingly varied. You’ll discover great natural beauty among the wooded flanks of both Manigod and Beauregard sectors (much of it Blue-graded, and a good place to start the day) and some steeper Reds nearby in the Etale and Aiguille areas. More challenging, gradient-wise, are the flanks of the Massif de Balme, which has hosted speed-skiing record attempts and whose snow quality holds up well later in the day. One particularly inspired feature is the provision of long return runs, graded from Green to Black, allowing skiers of all abilities to end their days in real style. Lift-wise, the system works well and the signs of investment are clear enough. Here and there, though, you'll still encounter an important link served by a slow drag-lift, which won’t suit everyone. Some major changes from winter 2017/18: the Crêt du Merle chairlift has been upgraded to a 6-seater detachable with a new departure station including the ticket office, sports club, ski lockers and an access ramp on the front-de-neige for people with reduced mobility. Traditional village centre with chalet-style accommodation. Get away from it all in small, more remote villages. 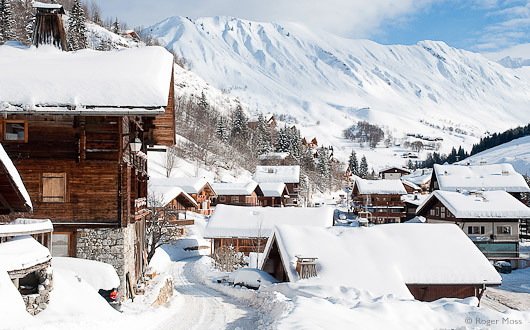 Despite being far from small, the main village has been careful to preserve its traditional Savoyard look and feel. The skyline is still dominated by the 18th-century belltower of the Eglise Sainte-Foy, and a high proportion of visitor accommodation is in individual mountain chalet style. At nightfall the village looks a picture and there's plenty of choice for those in search of nightlife, although the influx of day-skiers can create traffic problems and fill public car-parking areas (most of which are payable). Frequent free shuttle-buses serve less-central park areas, however. For a dramatically simpler option in magical surroundings, consider a base away from things over in the Manigod or Merdassier areas (and pack snow-chains if you’ll be driving there). 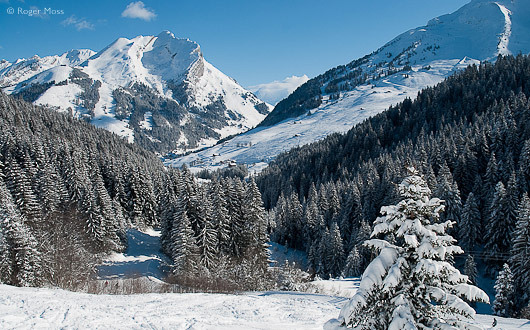 Why go skiing in La Clusaz ? Most levels of skier, with particular appeal for those looking for traditional character, both on and off the mountain, without compromising the skiing experience. The local mountains offer chocolate-box scenery, yet are big enough to provide some surprisingly long runs – along with some surprisingly steep ones, too. It’s a solid choice for mixed-ability groups and those improving their skill and fitness levels. Beginners have a safe, self-contained area just beside the Beauregard gondola, on the other side of which is the Jardin d’Enfants children’s area. Designed for 3 levels with good variety. Family fun zone. Classic Alpine town in an incomparable location. New Family Fun Zone in secure area for initiation into freestyling. Accommodation for most budgets including expanding luxury sector, in a choice of settings. Party vibe if you want it. 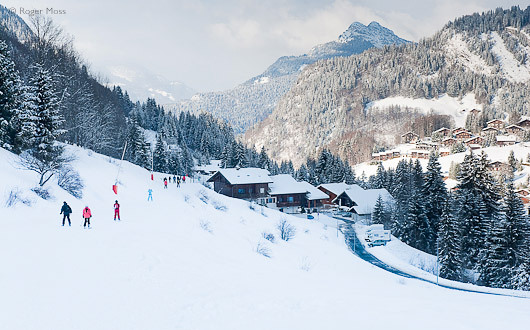 Shuttle bus links other Aravis resorts of Le Grand Bornand and Saint-Jean de Sixt. Short transfers from Geneva flights or TGV rail connection in Annecy. 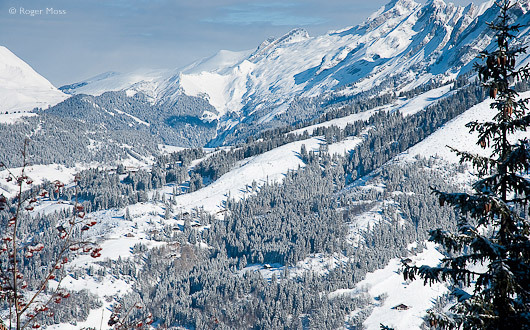 Superb destination for short break skiing. Weekends bring lots of traffic and pressure on local car-parks (which are pricey). Buy your lift-pass in advance to avoid Sunday morning ticket queues created by day-skiers. Download the free app available for iPhone and Android. 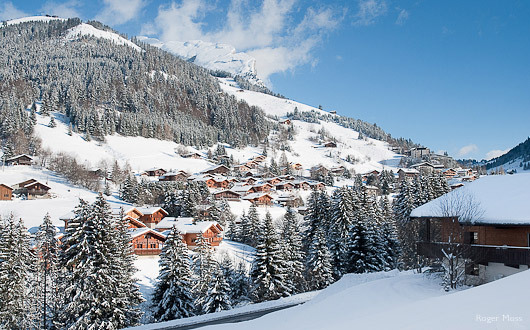 An attractive chalet style hotel with fabulous views over the village to the slopes. Its location, just 150m from the lifts make this central hotel really convenient for skiers and great for strolling out in the evening to enjoy the nearby bars and restaurants. The hotel has a heated indoor pool, sauna, fitness room and beauty, spa and balneotherapy treatment area - perfect to soothe those aching limbs. The buffet style breakfast is plentiful and delicious and is served in the large, sunny restaurant on the ground floor. In the evenings, you can dine here and enjoy traditional cuisine whilst admiring the panoramic views. Parking spaces are extremely limited so expect to use one of the nearby car parks (payable). This luxury 5* Hotel & Spa, one of the finest in the Alps, is located in the centre of the village with direct access to the ski-lifts. There are 50 luxury suites, all with lounge and balcony and indulgent balneo bathrooms. They are beautifully decorated in a blend of old wood and chic contemporary mountain style with high quality fittings and equipment and luxury soft furnishings. The facilities at Au Coeur du Village include an indoor heated swimming pool, Jacuzzi, steam room, sauna and a super Spa offering sumptuous treatments including massages and body scrubs. The bar/lounge area with its attractive central fireplace is the ideal place to relax and unwind after a day skiing. The restaurant offers a refined cuisine based on organic locally sourced produce in an attractive setting. World champion freerider and holder of several other major titles, Antonin Lieutaghi likes nothing better than exploring the Massif des Aravis, whether its on skis, snowboard or mountain bike. His formidable skills and knowledge make him a capable and reassuring guide for freeride adventures here or in the Haute-Tarentaise, Mont Blanc and Aosta Valley. For full details of freeride ski touring and heliski packages visit the SkiDimension website – only in French, although Antonin speaks English. Ski joering is an exciting sport and is best described as horse-drawn skiing. Even beginners (it helps if you ski) will soon be able to go for a ride through the wild mountains, away from it all in near-silence. You are shown how to control your horse and should soon master the simple techniques required as you begin to enjoy the thrill of ski joering. Information and booking: +33 (0)6 15 65 11 11 or speak to the team on-site at the Col de Merdassier (English spoken). There’s a really warm and welcoming atmosphere in La Ferme, which is situated on the Crêt du Merle piste but is also accessible on foot. Dine here any time of year to savour local specialities, pizzas, salads and fish. We enjoyed the friendly ambiance and loved the beautifully-presented food. La Ferme is also an hotel, with rooms starting from €85 in low season. Situated at 1450m altitude, reaching Le Bercail in the evening in winter is something of an adventure. You can telephone and get a lift on a snow-mobile, but we took snow-shoes and walked down the piste, after driving as high as we could on the snow-covered road (there’s parking at the Crêt du Merle). After everyone has made such an effort to arrive, the atmosphere is convivial and there is plenty of local mountain specialities to try including Beignets de pommes de terre, Tomme blanche (very fresh cheese), Reblochon (of course) and mountain boudin (rustic sausages). Follow the A41 to Annecy (north) then the D909 to Thones, Saint-Jean-de-Sixt then La Clusaz. Alternatively, follow the A40 to Bonneville via Geneva, where you take the exit signed Aravis Resorts. Lyon airport (150km) has bus connections every day by reservation, see www.altibus.com to book. Expect to pay around €75 return. Travel by Eurostar to Paris then fast train TGV from Paris to Annecy. (3½ hrs). Transfer options are given in detail on the Tourist Office website. 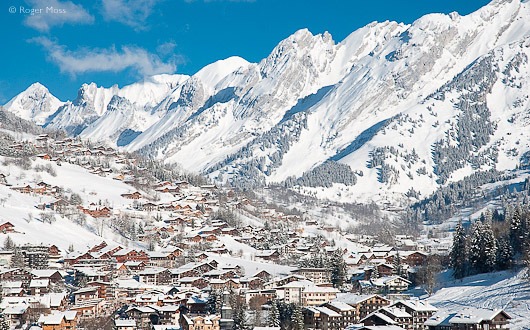 We last skied in La Clusaz a long time ago, and much has changed. The replacement of the Beauregard cable-car by a high-speed gondola really improved access to the eastern terrain where we and many others like to begin our days’ skiing. The ride up provides a dramatic overview of the village and its unmistakable setting, before dropping us at 1635m. Ahead is a large children’s area, while to the left and right tree-lined Blue or Black pistes head all the way back down again, but we take the gentle Blue-graded run over to the nearby Croix-Fry area. The landscapes, looking pristine after a long night of continuous snowfall, are a picture, and Croix-Fry sits among them like a tiny ski-village in a world of its own. The beautiful Manigod valley after fresh snow. The distant summits of the Etale Massif and its neighbour L'Aiguille. The landscapes, looking pristine after a long night of continuous snowfall, are a picture, and Croix-Fry sits among them like a tiny ski-village in a world of its own. There’s another beginner area here plus a selection of Red and Blue runs, but we take a lift up and over the Tête de Cabeau (1650m), where we pause briefly to take in the definitive overview of the Manigod valley before dropping into the Merdassier sector. The change of mood is accentuated by the dramatic backdrop of the Massif de l’Etale looming some 2400m before us. The Col de Merdassier is a pleasant area, and we take the Chevreuil lift back up to the Tête de Cabeau to repeat the run before taking an early lunch-break and moving across to confront L’Etale. The majority of runs on this side of the valley are Red-graded and served by drag-lifts, the steepest of which (Le Grand Chamois) hauls us up to a vertiginous viewpoint above a narrow adjoining valley. On the bracing run back down we peel off to join a gentle, Green-graded cruise round to the Grands Laquais drag-lift to join the Blue-graded Les Joux piste. Once down we transfer to the modern Transval cable-car across to the Combe des Juments. The onward haul via two chairlifts up to L’Aiguille (2257m) puts us way above the popular Crête du Merle area and allows us to pick up the Red-graded Fernuy piste for the long and exhilarating plunge to the foot of the La Balme gondola. Picturesque intermediate runs above Merdassier. Piste-side chalets in La Clusaz. The snow below the 2477m Col de Balme holds up well in the afternoon, encouraging the kind of E-W progression which has brought us so far from our starting-point. It’s worth the effort, as we discover while exploring as much of the Red and Blue-graded terrain above us as time allows before we have to think of our return route. We could be sensible and take the relaxing La Motte return Green run back to the upper end of the village, but instead ride the Fernuy gondola up to Côte 2000. By now it’s getting late, and we emerge from the gondola into a bitter wind, determined to let our skis run on the succession of Red and Blue pistes which will take us back to where we began. It’s a long way… much further than we’d imagined, but doesn’t involve another lift – a reassuring thought at the end of the day. By the time we’re cradling steaming mugs of vin-chaud back in a snug piste-side bar in La Clusaz’s charming village we’re in no doubt that you can cover a lot of ground in a determined day’s skiing here. With the benefit of a longer visit we could have seen even more and explored each of the areas in much greater depth. Next time, maybe; for now we’re happy to settle for being hugely impressed. L'Envers is the gentlest of return runs and will drop you at the very foot of the Beauregard gondola.